Horse drawn carriage ride in Cades Cove. 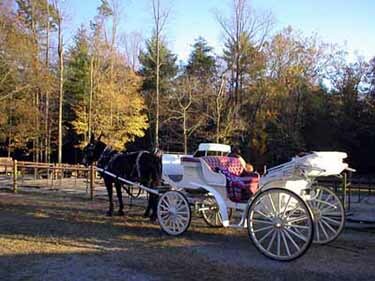 Great Smoky Mountains National Park offers carriage rides seasonally from March through October. Nestled in the shadow of Great Smoky Mountains National Park, in historic West Millers Cove, you will discover a special place called EchoBrooke Farm. A collection of horse drawn vehicles and sturdy Belgian and Percheron horses provide a means of travel back to a simpler time, to a way of life we have come to embrace, and now share. Carriage Rides and Hay Wagon Rides are the heartbeat of EchoBrooke Farm. Here you can clip clop down a shady lane or amble through the countryside. Slow your pace of life. Enjoy wild flowers and wildlife. Experience scenic vistas and pure mountain streams. Discover the beauty of the Smoky Mountains at a leisurely pace.